Also serving communities of Bastrop. There are 5 Assisted Living Facilities in the Monroe area, with 3 in Monroe and 2 nearby. The average cost of assisted living in Monroe is $3,500 per month. This is higher than the national median of $3,346. Cheaper nearby regions include West Monroe with an average starting cost of $2,972. To help you with your search, browse the 25 reviews below for assisted living facilities in Monroe. On average, consumers rate assisted living in Monroe 4.5 out of 5 stars. Better rated regions include Ruston with an average rating of 5.0 out of 5 stars. Situated in Ouachita Parish, Monroe, La., seniors ages 65 and over make up almost 14 percent of the population. Seniors may want to visit the Louisiana Purchase Garden and Zoo or take classes for enrichment at one of the area's three colleges. There are five assisted living facilities in and around Monroe for seniors who find daily activities too difficult to complete on their own. Such facilities are regulated by the Louisiana Department of Health. The air quality in the Monroe, Louisiana is very good. It receives an overall "A" rating from the National Lung Association, making Monroe an agreeable place to live for seniors with respiratory conditions. The cost of living in Monroe is 19 percent less than the national average. The cost of groceries and utilities are less in Monroe than the U.S. average, which could be helpful for seniors on a budget. Monroe, located in northern Louisiana along the Ouachita River, is known for its hot, steamy summers and mild winters. The average high temperature in January is 57 degrees Fahrenheit, and the average high temperature in July is 94 degrees. Crime is a big problem in Monroe; in fact "USA Today" recently named it as the number one city in the U.S. where crime is rising. The crime rate in Monroe has soared 85 percent in the last five years, making it 336 percent higher than the national average. The Monroe Transit System offers 13 fixed bus routes that connect points within the city as well as with other points in Ouachita Parish. In addition, the Ouachita Council on Aging offers on-demand non-emergency transportation for seniors, with advance reservations. Monroe, Louisiana offers a number of cultural opportunities. The city is home to the Biedenharn Museum and Gardens, the Chennault Aviation and Military Museum and the Masur Museum of Art. Most of the attractions and events in Monroe offer some kind of senior discount, although the qualifying age varies. Assisted Living costs in Monroe start around $3,500 per month on average, while the nationwide average cost of assisted living is $4,000 per month, according to the latest figures from Genworth’s Cost of Care Survey. Eligible seniors who live in Monroe, Louisiana can find financial assistance from a number of state and federal government agencies. 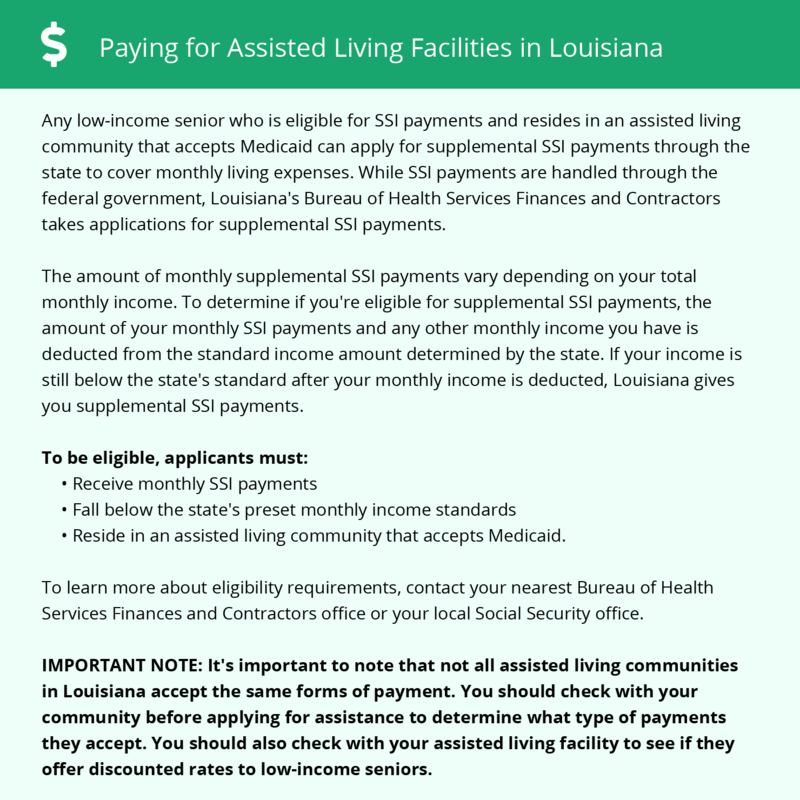 These include the Community Choices Waiver (CCW) and Supplemental Security Income Category G.
To see a list of free assisted living resources in Monroe, please visit our Assisted Living in Louisiana page. Monroe-area assisted living communities must adhere to the comprehensive set of state laws and regulations that all assisted living communities in Louisiana are required to follow. Visit our Assisted Living in Louisiana page for more information about these laws.